For some reason the last couple of weeks I've had Saltspring on the mind. Prolly (as daninokc says) because I just read this really great novel titled THE HIGHEST TIDE by Jim Lynch. It is a lovely tale of a quirky, unusual and special kid in Olympia WA who has a very special relationship with the small cove and the Puget Sound, where he lives. The only regret I have is that this book was way too short. At 250 pages I read it almost without stop I was so captivated and caught up in its charm. 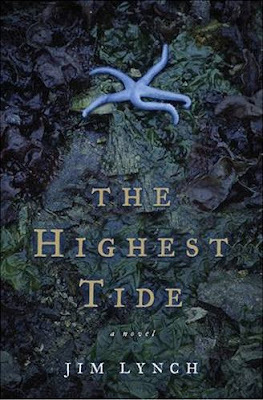 Thirteen-year-old Miles O’Malley lives on Puget Sound and knows everything there is to know about the sea and its creatures. When he becomes the first person to sight a live giant squid he is hailed as some sort of prophet. The media descend and everyone wants to hear what Miles has to say. But Miles is just a self-described “increasingly horny, speed-reading thirteen-year-old insomniac” who’s in love with the girl next door and obsessed with the writings of Rachel Carson. While the sea continues to offer up surprises from its mysterious depths, Miles navigates the equally mysterious world of adults. Strange events continue over the summer, culminating in the highest tide in 100 years." This truly beautiful story has the most interesting and multifaceted set of characters, most notably, the book's protagonist, Miles. When we begin the book we learn that Miles looks to most of the world as though he is 9 or 10 years old as his growth has been stunted. Which serves really as a metaphor for the book because by the time we come to the perfect end, Miles has grown figuratively and literally into a young man. What I think you appreciate most is the unique, very mature perspective that Miles has on the world. I suppose that Miles also appealed to me because he is an insomniac and he reads voraciously. I suffer the same curse and passion, respectively. Mr. Lynch's first novel is truly remarkable and you should run out and get it immediately. You will not be disappointed. 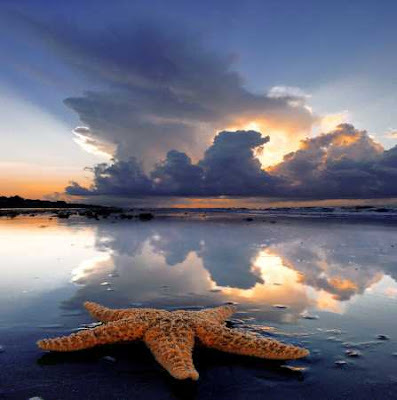 Okay, so starfish. Oftentimes I will buy a book because the cover attracts me. Which was the case with THE HIGHEST TIDE. 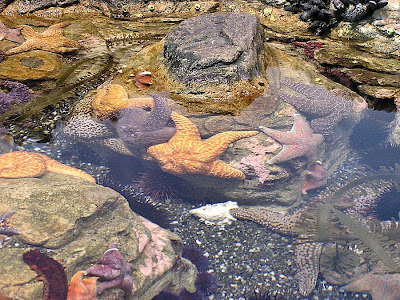 I loved the starfish on the cover in the tidal pool because it evokes very fond memories of vacations past that we've spent in the Gulf Islands of British Columbia. For a guy who came from West Texas, experiencing British Columbia was an awakening indeed. On more than one of our previous vacations, Steve's nieces and nephews joined us when they were very young and we would all frolic and play in the ocean the way only young kids can (or rather were able to watch the young kid's frolicking). For our vacations in BC we usually would rent a house for 2-3 weeks. 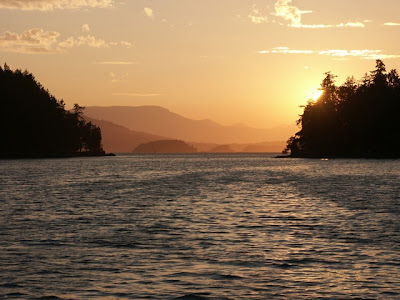 Twice we stayed on Saltspring Island which is the most populous of the Canadian Gulf Islands and has the largest town, Ganges. All of the houses that we have rented were situated right on the water and the fun thing I discovered was the concept of a tide and tidal pools when we first visited the island. 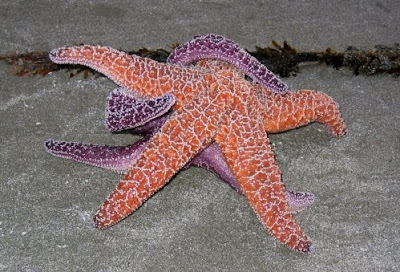 I also discovered and was charmed by starfish and all of the various colors they come in (I've always been attracted to colors): orange, blue, purple, red. 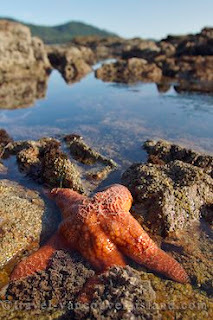 When the tide comes out they are stranded in tidal pools or sometimes completely out of water. I remember being fascinated watching them and their slow movement. You could stare at them forever and it seemed they hadn't moved and then suddenly as if magic had occurred they would be in a different position. Really fascinating. We started collecting little starfish tchotchke's as a result when we traveled and have an assortment hanging on a wall in our kitchen. Anyway, since we haven't had a vacation in a couple of years (alas, can anyone afford to do anything these days?) and I'm literally sick of the intense desert heat, I've been obsessing over our past Gulf Island vacations and so will "prolly" (as daninokc says....I just love his term for "probably") do a few postings on British Columbia because it truly is one of the most beautiful locations on the planet. Someday, one of my "MEWANTS" (see my posting on MEWANTS) is to have a house in Gulf Islands. It really is the most idyllic getwaways. 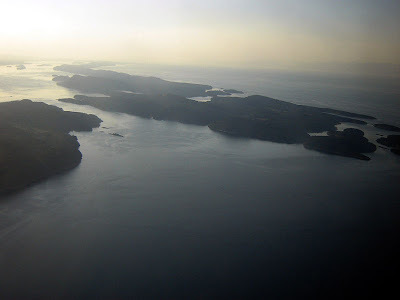 We've stayed now on two of the islands: Saltspring and Maine, and we've traveled to all of the others by ferry or boat. The interesting thing about the islands is that they all have varying ecosystems. I love Saltsping because it is a haven for artists, and we've always brought back wonderful treasures of pottery, paintings, and other perfect objet d'art. The Gulf Islands are the islands in the Strait of Georgia between Vancouver Island and the mainland of British Columbia, Canada. 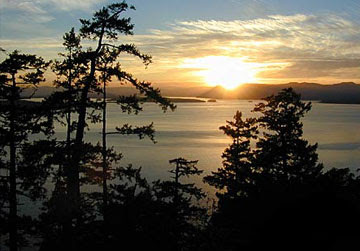 The Gulf Islands are usually divided into two groups, the Southern and Northern Gulf Islands. 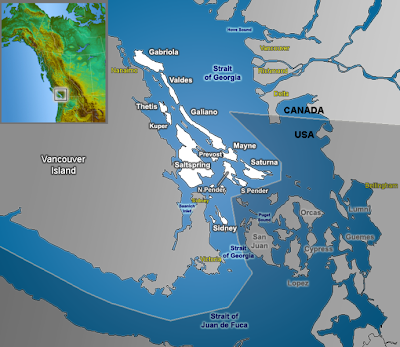 The dividing line is approximately that formed by the city of Nanaimo on Vancouver Island, and the mouth of the Fraser River on the mainland. All the major islands are served by B.C. Ferries. 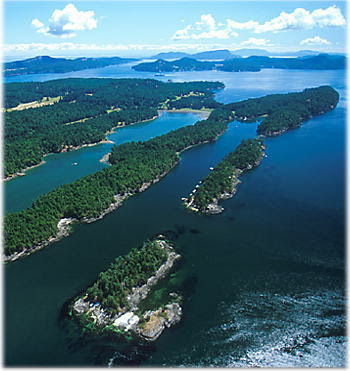 The southern Gulf Islands include hundreds of islands and islets, and form part of an archipelago that also includes the San Juan Islands in the United States (separated by the Straits of Juan de Fuqa). More about the wonderful Gulf Islands in upcoming posts but I'll leave you with some photos to admire of the area.